So Rafael has been working out in the campo, long hours, and finally it’s all paid off and he’s brought home the bacon. Or rather, he’s brought home the almonds. Thousands. Hundreds of thousands. And he appears to be storing them in his front room. He reckons he has several thousand trees. I think he had help picking them and loading them into the sacks. But once he’d brought them back to our little cul-de-sac he was on his own. The family two houses up the hill from me sat and drank and laughed and called out, making generally encouraging noises as Rafa heaved every single heavy sack out of the truck by himself. I leapt around asking naïve questions and generally getting in the way, but all the time providing enormous entertainment for the street. 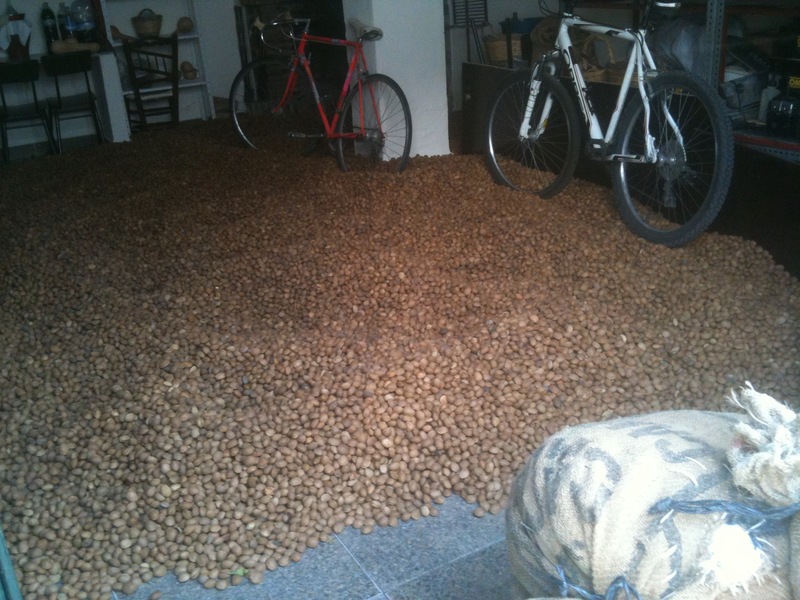 “You’ve never seen sacks of freshly-picked almonds before?” they asked, horrified. “What, you’ve never seen half a million almonds in a heap in somebody’s house before?” “So, in your country, where do people put the almonds when they’ve picked them?” Where, indeed. Later, when I popped into the Arco del Sol bar a mile or so out of the village, they somehow already knew I’d asked questions about the almonds and taken pictures. Old men were chuckling on barstools, wondering why anyone would take pictures of something so mundane as a heap of almonds. They stared when I turned up. I was Exhibit A. They were delighted to see the actual foreign lunatic they’d been laughing about before I walked in. Rafa’s harvest will go mostly to be made into turron, the yummy nougat which floods the shops at Christmas time. 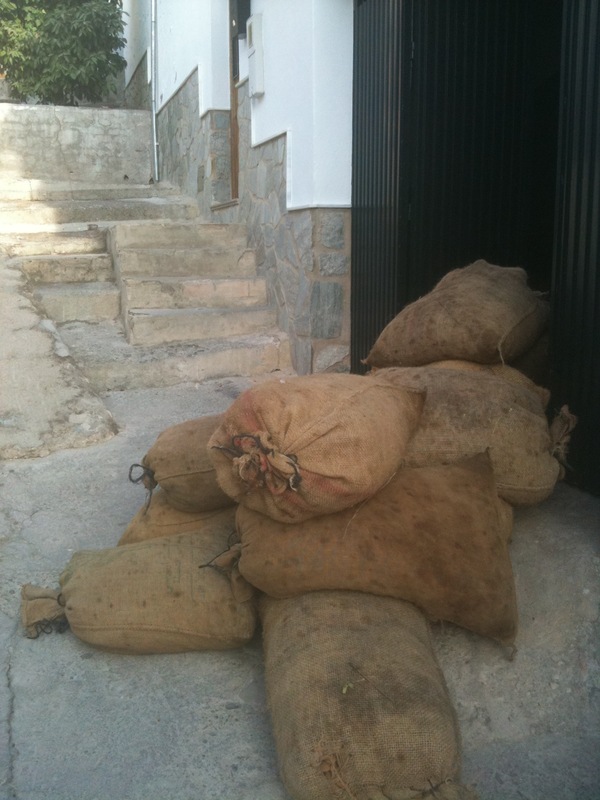 The finest almonds will be taken to be put into bags of frutos secos (dried nuts and fruit). I can’t necessarily tell the difference between a merely average almond and a particularly fine one, but his harvest looks good to me. Even with the bicycles parked in it. This entry was posted in Spain and tagged Almond harvest, Andalucia, Colmenar, Spain, SpanishBlog, Tamara Essex by tamaraessex. Bookmark the permalink. WOAH! It´s not like that around here for harvesting the almonds. First of all you need some FLAT LAND to get the big machinery in to shake the trees like that! We have 40 almond trees on our land and there are plenty in the campo nearby, with a similar procedure to olive harvesting taking place. Men with long sticks (often itinerant, immigrant workers) come along and beat seven shades out of each tree, collecting the nuts (or olives depending on the time of year) in hugs nets they have previously spread underneath each tree. Surely that´s what Rafael did? Poor man must be exhausted! I agree Marianne. I’m sure he uses the manual system. Or perhaps the semi-manual system – when the men use the enormous vibrating sticks. I just loved that video clip and the speed of it! I saw a tractor with that big blue catcher parked up, a bit further north, so was glad to see one in action on YouTube. The crop trees would certainly need to be planted further apart to use this method.